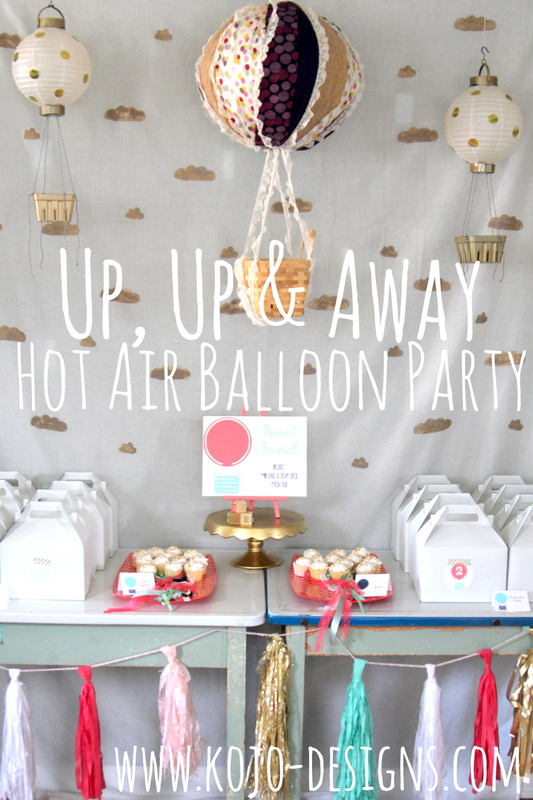 This Up, Up and Away hot air balloon birthday party for our two year old buddy, Hazel, was fun to put together and even more fun to attend (as the mama of two of the party guests, I can attest to this first hand). Hazel’s mama, Liz, and I are a match made in party heaven- she shares my love of details, and of favors (just wait until you see the favor buffet), and of general party over-the-top-ness. It’s great. And Mission- Awesome Birthday Party for Hazel (round 2) was one giant success. …and hot air balloons on signs. …and little ‘2’s’ commemorating the birthday girls’ big new age. Boxed brunches were the perfect match for our kid heavy guest list. Each boxed brunch included fruit and a hot air balloon mini bagel and cream cheese sandwich. …and chocolate, strawberry and white milk. YUM!